Once again we enter that rarest of times (other than elections) where local councils appear to take an actual interest in what their ratepayers say and think – Long Term Plan consultation. This period’s consultation for Napier ratepayers focuses largely on water – the safety of drinking it, its encroachment on our shorelines and how we can avoid and remedy polluting it. 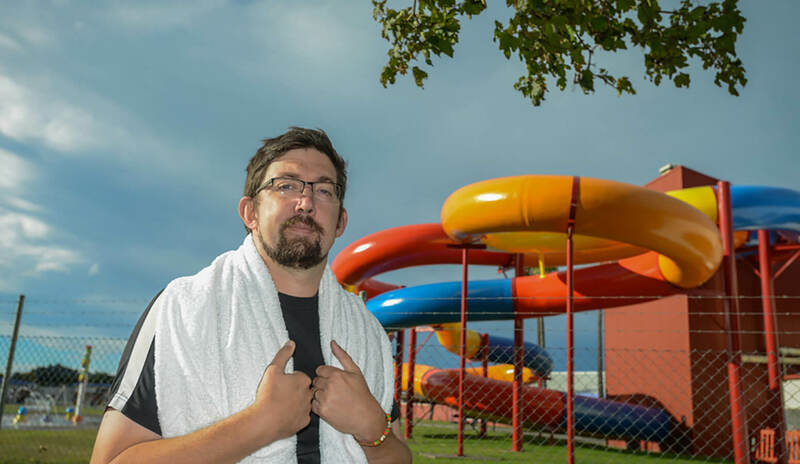 It also looks at leisure and enjoyment in and around water, as recent times would appear to have seen more chlorinated water springing from our household taps than into public swimming facilities in Napier. Which leads me to one key missing element of the current Napier City Council Long Term Plan discussion – a publicly supported 50 metre civic swimming pool. Onekawa’s ‘Olympic Pool’, a 50 metre outdoor pool, was built in 1963 and for generations was a key feature of many Napier schools’ swimming sports days, water safety and learning to swim programmes. Not to mention being a great, safe place to go on all those long, hot Hawke’s Bay summer holidays. It closed in 2008 after falling into disrepair. It was estimated the cost to partially repair or renovate the pool at that time was around $2 million. NCC’s community development manager at the time of the pool’s closure said the popularity of the outdoor pool had dropped when the neighbouring, indoor, Ivan Wilson Pool, which included a 25 metre heated lane pool, children’s pool and other amenities and attractions, opened in 1998. The cracking, leaking, and subsidence problems that forced the pool’s closure were found to extend beyond the pool complex to surrounding parts of its suburban Onekawa site four years later, as in a previous life the area had been one of the city’s landfill dumps and subsidence and toxic contamination soon caused all sorts of issues for residents and the council and its management. Fast forward just under ten years from the Olympic Pool’s pool closure and, in 2017, with public heat coming on Napier City Council over their obsession with a ‘multi-use sports facility’, NCC decided to take a dip back into the pool issue, as it had become clear ratepayers preferred more public pool space over a velodrome. With the closure of the 40-year-old Greendale Swim Club Pool in Taradale due to structural earthquake risks, and other swimming clubs and activities taking up what few lanes the indoor Onekawa Aquatic Centre had during peak times, Napier’s water-loving ratepayers were feeling left high and dry. The council, as they do, commissioned consultants to produce reports on the matter. The consultants’ recommendations produced three options that Napier ratepayers were encouraged to “Have their say” on: A new 25×25 metre pool; redevelopment and extension of the aquatic centre complex, as it was apparently no longer “fit for purpose” in its current form; and a new version of the old 50 metre ‘Olympic Pool’. However the consultants said this last option was only “included to ensure the community are fully informed”. The public’s response was “overwhelming support” for the option that included the 50 metre pool, amongst other facilities, with a price tag of around $38 million. “While option three is projected to be a little more costly to build and more costly to operate, the unequivocal nature of the consultation results indicates this is the community’s preferred option,” Hawke’s Bay Today reported NCC’s sport and recreation manager writing to the council’s Community Services Committee. The committee agreed to support design development, schedules, and costs for the public’s preferred 50 metre pool complex and for it to be considered during the 2018-2028 Long Term Plan consultation. So it is startling to discover, upon browsing through the newly-released “Say it Napier” Long Term Plan 2018/2028 consultation document a total absence of this publicly preferred return of a 50 metre pool to the Onekawa Aquatic Centre complex. Out of the blue, the council’s preferred option is a new facility on council-owned land bordering Prebensen Drive featuring a range of facilities including a 25 metre pool, with the option to possibly extend it to 50 meters sometime in the future. But you must imagine this option would be even more expensive, cumbersome and intrusive to the facility. The secondary option being redevelopment of the current Onekawa facility, with a new 25 metre pool, plus learning pool and gymnasium. The document rules out a 50 metre pool for now, saying that increased construction costs nationwide and increased operating costs (in the space of a mere six months), “The revised estimate has increased by $12 million to $51.7 million to construct and will add over $100 a year to rates per household.” And notes that a proposed 50 metre pool at Hastings’ Regional Sports Park (not yet confirmed or publicly consulted) would mean a duplication of facilities. What short memories those behind the planning and consulting of the 50 metre pool development have. Water is heavy. A 50 metre pool would contain 1875 tons of water alone, never mind the concrete needed for the pool and other facilities. Hardly an ideal mass to put on land with subsidence issues. And then there would be the disposal of contaminated soil to deal with when excavating the pool area. This would appear to rule out Onekawa as a future location of a publicly preferred 50 metre pool, with the council pointing to Prebensen “if there is demand in the future”. So much for the clearly expressed current demand! If the council’s proposed Prebensen Drive site is big enough to eventually/potentially extend to a 50 metre pool, why not start with the pool that size and give the public what they have requested? After all the public backlash over the War Memorial and one councillor revealing the city’s elected officials may not be getting fully informed on matters by council management, one must question just how much of a say or control Napier ratepayers actually have in their city. And when we do have our say, will the council actually listen, or just continue to follow their managers’ recommendations?